Hard to believe, but there are now under ten games to go for the New York Islanders this season. This year has been wild, unexpected, and has breathed new life into the franchise. Now in the homestretch — and after Tuesday’s abysmal defeat at the hand of the Bruins — the magnitude of each game is ratcheted up ten times more. There are still things to clean up before the team gets set for the postseason to start in 20 days, but there are still important games on the docket and it starts tonight in Montreal. 1. The Islanders were humbled in Tuesday’s loss. Forget the narrative the Isles are in the same league as the Bruins (they’re not), but the piss-poor showing two nights ago was another example of why you can’t ever take a night off in this league. Defenseman Scott Mayfield said it perfectly, “They were playing May hockey and we were playing October hockey”. To be frank, the Islanders were out of this game at the drop of the puck. They immediately let the B’s go right to work and allowed them to dictate the pace for the entirety of the game. The 5-0 score — and 39-13 shot differential — doesn’t even marginalize how awful of an effort it was from all 20 skaters. Hopefully, inside the Isles room that defeat was a big learning experience because for all the Isles have achieved this season, they still have a long way to go from being a top-tier team. The last thing I’ll say about the defeat: If Barry Trotz’ group wants to have any success come the postseason, an effort like Tuesday’s is completely unacceptable. 2. The defeat in Detroit was the hockey gods returning the favor for the win in St. Louis. This one might get some funny looks. Then consider how the Islanders dominated Detroit offensively from start to finish, and you’ll realize it was a total reverse from the win in St. Louis in early January they had absolutely no business winning. In the St. Louis game, Trotz’ skaters basically no-showed but scored four goals on 14 shots (three on six shots in the final frame) and got a wonderful performance from goalie Robin Lehner and escaped with a win. Last Saturday, the Isles did literally everything to score, including throwing 42 shots on Wings netminder Jonathan Bernier. But they could only muster one goal and hit three different posts, one late where defenseman Ryan Pulock could have sent the game to overtime. Call Saturday’s setback karma for the team being handed a game they had no right being in earlier this season. 3. The Minnesota boys always put on a show for the home crowd. Anytime Anders Lee, Brock Nelson and Nick Leddy return home when the Isles are in town, they always seem to find a way to have an impact. Lee, the native of Edina, MN, scored the Isles first goal of the game in Sunday’s 3-2 OT win. The goal made it five points in the last five games for Lee at Xcel Energy Center. Nelson, from Warroad, scored the game-winner off a sweet fake from Mathew Barzal to make it a two-point night. He always seems to bring his A-game when he’s back home. Eden Prarie’s Nick Leddy didn’t get on the scoresheet on Sunday but always flashes for family and friends. 4. Brock Nelson breaks a new mark. Nelson’s turnaround was only magnified more by his performance on Sunday night. Not only did he get the game-winning goal, but the 27-year old set a new career-high in points with 47 with an assist on the Islanders first goal. The numbers help represent how effective Nelson has been this season than in years past. There was a time when Nelson was probably the most maligned player on the Islanders just below Josh Bailey. Now, Nelson has become a prominent piece of the Isles offense. 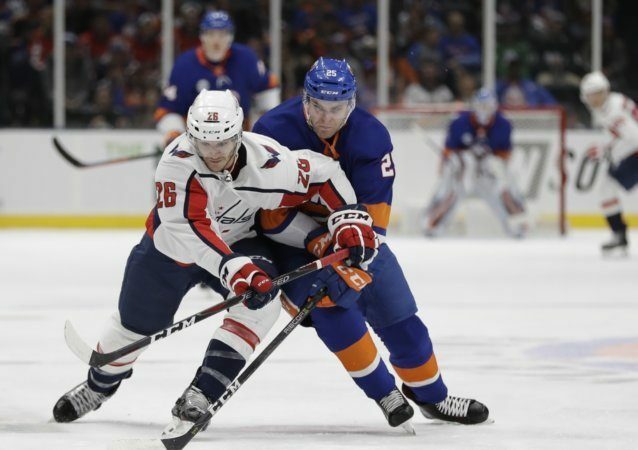 Trotz envisioned Nelson as the club’s number two center after John Tavares departed to Toronto, and he’s taken full advantage of that opportunity. Maybe it results in a new contract. But at this juncture, Nelson is probably at the head of the pack for the most improved player this season. 5. Filppula being out hurts in more ways than one. As if getting throttled 5-0 wasn’t the worst thing that happened against Boston, seeing Filppula sidelined till most likely the second week of the playoffs was a real gut punch. Filppula, 35, has been a solid add after signing a one-year contract back on July 1. His offense has tailed off after a hot start, but defensively and from a leadership standpoint, Filppula has been exceptional. Where Filppula’s injury could be a major problem is just that, his play away from the puck and on the penalty kill. Filppula has helped the penalty kill the last two months turn into one of the league’s best with his aggressive and heady decisions. He’s anchored the third line all season that will now have to put spare parts together that can give Trotz the ability to roll four lines down the stretch. He not being in the last few games of the season — and the first few playoff games — devoids the Isles of someone who knows the grind it takes to win in important situations. A major loss at the most inopportune time for the organization. 6. Mathew Barzal has refound himself, and at the perfect time. The second half slog for Barzal has been frustrating on many fronts, but the last couple of games — detract the Boston game — he’s looked more like the reigning Calder winner from a year ago. 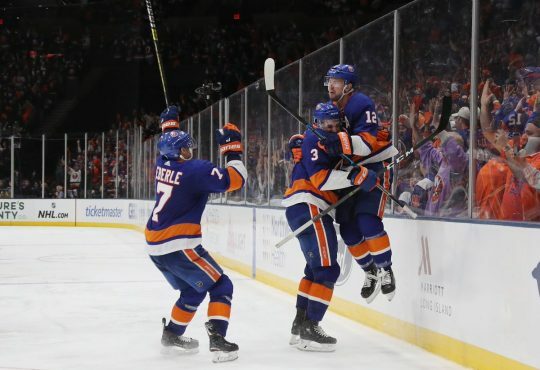 Getting ice time with new linemates, Anders Lee and Jordan Eberle, might have once again sparked that fire inside the sophomore center. The game against Montreal — and the absolutely delicious pass he made to Lee for the go-ahead goal — saw Barzal return to that bulldog mentality with the puck. Against Detroit, he was scoreless but was flying and making smart play one after the other. In Minnesota, his two assists were one of the main reasons the Islanders generated offensively and eventually won the game. The Isles could not have asked for a better time for Barzal to get hot, especially with a playoff berth within reach and the postseason on the horizon. 7. The road will determine the teams’ fate. The Isles have been a different team on the road this season. Credit Trotz and his staff for most of that, plus some stellar performances in goal from Lehner and Thomas Greiss. Now the season, and likely the division, will come down to how the Isles fare away from Nassau Coliseum. Six of the last nine games for the team come with stops in places they have not seen much success — Florida, Winnipeg, Columbus, Washington. Those four teams will make any Isles fan sigh. If the Islanders are going to be a playoff threat, these are the games that will make people take notice. 8. This is Andrew Ladd’s shot to get back in the fans good graces. Ladd’s return has not been the most prolific, but he’ll get his chance to finally get going playing with Barzal. As a veteran, Ladd knows what it takes to win when the stakes are raised. It’s crucial the two-time Cup winner takes full advantage of this opportunity. Trotz and his staff will definitely be leaning on Ladd come playoff time. Now though, this might be Ladd’s last chance to finally start producing and living up to his albatross of a contract. 9. Once again, Matt Martin shows why he’s the heart and soul of the organization. Anyone who not only wants to fight Zdeno Chara, but then actually goes through with it, gets full marks in my book. I commend Martin for trying to do anything to get his team going after they were almost run out of the building in the first period. Mind you, the fight took place when the game was still only 1-0. But this fight once again showed that Matty Marts will do whatever it takes for his team. They don’t make guys like Martin nowadays. 10. Who would be the better matchup, Pittsburgh, Carolina or Columbus? It’s almost certain that one of these three will be who the Islanders match up against in the first round of the playoffs. But, while all three teams provide a good challenge, the Isles could have a small advantage. The Pens still have Sid Crosby, Evgeni Malkin and are battle-tested, but the Isles frustrated them in most of the four meetings this season. Carolina is fast and will be highly motivated to win a round for the first time in nearly a decade. Trotz’ crew did take three of the four games between the two and found ways to slow down the Canes high-tempo style. And can coach Rod Brind’Amour really trust Petr Mrazek and Curtis McElhinney in goal? The Blue Jackets are interesting. John Tortarella’s bunch went all in at the deadline and are banking on finally securing the franchises’ first playoff series win. The Islanders though, match up well in terms of defense and goal. Verdict: Give me the Hurricanes.